In 1532 the Flemish artist Jan Sanders van Hemessen (c. 1504-1556) was in his Antwerp studio putting the finishing touches to what was one of his most important commissions to date. 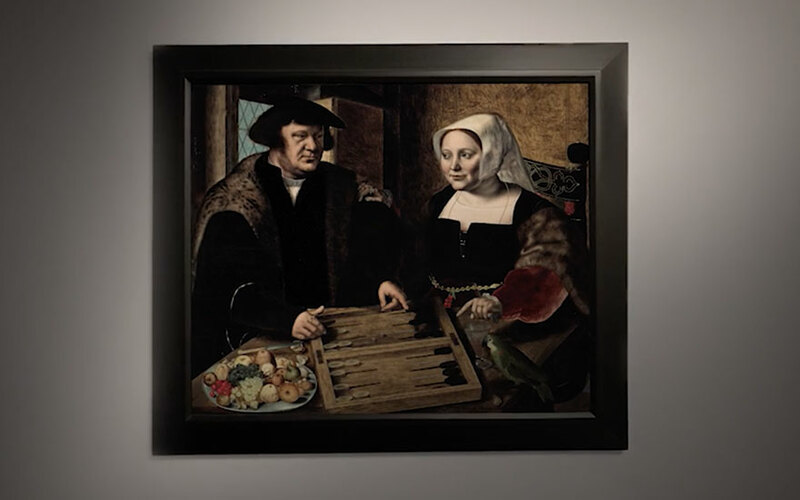 The work, titled Double Portrait of a husband and wife, half-length, seated at a table, playing tables, was created to celebrate the wedding of a local couple whose names are now lost to time but are thought to have been a wealthy Flemish burgher and his new wife. Van Hemessen had spent part of the previous decade travelling across Italy, where he studied the recently unearthed Laocoön sculpture, on display in the Vatican, and contemporary Renaissance works by Michelangelo and Raphael. After returning to the Low Countries he joined the Guild of St. Luke in Antwerp and began synthesising the monumentality of Italian art with the rigid realism of the paintings of his native Netherlands, which is perhaps why this bourgeois couple asked him to paint their portraits. In Van Hemessen’s Double Portrait, the man stands proud in his pristine linen undershirt worn beneath a smart black doublet and lynx-fur cape. His wife, her hand resting on his shoulder, is adorned with a crisp linen hood and bright coral rosary beads. Unlike traditional Northern European wedding portraits, in which husband and wife would be painted on separate pieces of wood hung side-by-side, they are painted on the same panel. On the table before them is a rectangular wooden board next to a platter of ripe fruit and a parrot. The board is being used for the game ‘tables’ — a variant on backgammon. Since medieval times, this game of chance had been an allegory of vice, temptation or transience; Van Hemessen became the first artist to use it to represent courtship in a portrait. The work is offered from the personal collection of Frank Stella, who describes the relationship between the husband and the wife and the game as ‘spectacular’. So how did this painting, which is both ambitious in scale and inventive in iconography — and among the first and finest double portraits to be executed during the Netherlandish Renaissance — come to hang for more than 30 years in the the bedroom of one of America’s greatest abstract artists? Stella discusses ‘the bourgeois value of paintings’, and the idea of being able to ‘come home and sit in an easy chair and smoke a cigar and look at a beautiful painting. ‘It’s about art being able to relax you. After you’ve been in the studio you don’t want to go home and look at your own paintings.’ Despite the attraction to van Hemessen’s masterpiece, it would be the first and last Renaissance painting that Stella bought. Jan Sanders van Hemessen’s Double Portrait of husband and wife, half-length, seated at a table, playing tables (estimate: $4,000,000-6,000,000) is being offered in Old Masters I on 1 May 2019 at Christie’s in New York.